From thorny fruit to cocktail, Desert Harvester's seeks to show off Sonoran bounty. This June Tucson's Desert Harvesters will be busy talking to folks in town about how to use up all of the edible plantlife that exists around us. On Tuesday, June 9, you can head to La Cocina (201 N. Court Ave.) for an "Evening of Story, Food, Drink, and Music." From 5 until 10 p.m., dinner and drinks will be served featuring native plants, such as a margarita made with locally harvested prickly pear juice. Beginning at 7:30 p.m., Desert Harvesters' co-founder Brad Lancaster will speak about wild food propagation and strengthening our local community and ecosystem. Hey, Bucko! will be playing at the event as well. 10 percent of all proceeds from food and drink sales will go to the Harvesters and Lancaster's talk is free to listen to. Then, on Thursdays this month, the Santa Cruz River Farmers’ Market in conjunction with the Community Food Bank of Southern Arizona will be offering a Desert Harvest series designed in collaboration with the Desert Harvesters. 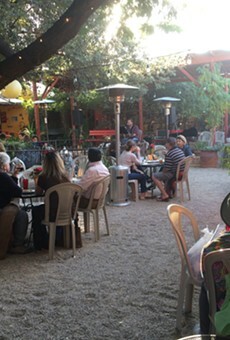 The events, which take place from 4 until 7 p.m. at Mercado San Agustin (100 S. Avenida del Convento), will cover a range of topics, featuring farmers, fermenters and chefs who know their way around Sonoran specialties. The series caps off on Thursday, June 25 with the 13th Annual Mesquite Milling and Wild Foods Fiesta at the market. While the event will feature tastings and more, those looking to mill can purchase mesquite to grind to nutritious flour on-site for $3 per gallon with a $10 minimum. Wrapping it all up on Friday, June 26, the harvesters will host a happy hour at Tap & Bottle (403 N. 6th Ave. #135) that will showcase regional brews infused with native ingredients. A portion of the sales will go to benefit the organization for beers bought between 5 and 8 p.m. So, you know, get out there and start foraging and creating unique desert treats before the monsoons come.